One of the Lingap Center initiatives is what we call home visitation. Each week, our social workers visit the homes of children in need throughout the community. This is for a variety of reasons, not the least of which is to determine if it is possible for any of the Lingap wards to be placed back with family members. It is our feeling that children are usually better off if they can be with family, provided they are safe from abuse or neglect. 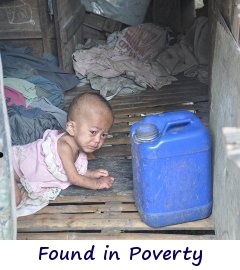 In January of 2011, a number of us, along with the Lingap manager, made a visit to the home of two of our girls, where we found a baby laying on the floor of a nipa hut, in a deplorable squatter area. The area was filthy beyond description and the baby was obviously very, very ill. Coincidentally, one of those with us was a doctor (a Lingap board member). He examined the little girl, estimated to be 9 months old, and determined that she was extremely malnourished (starving actually), dehydrated, covered with body sores and mosquito bites and she had a number of other problems. We tried to give her water, but she was too weak to even drink; it just ran out of the side of her mouth. He told us that she was very close to death - maybe only a few days. To our dismay, there was no adult or anyone for that matter, in the area. The baby was left entirely alone on a hot, filthy floor. We then went to a nearby nipa hut and found another one, in the same condition. They were twins and both were dying!! This was the first time since I have been involved with the Lingap Center project, that I 'lost it.' It was just about more than I could emotionally handle. Just remembering it today is difficult and the memory always brings tears. It was a fellow by the name of Bob Pierce who once said, "Let my heart be broken by the things that break the heart of God.� I'm sure that this is what he was talking about. We immediately contacted the local police and the Dept. of Social Welfare and Development (DSWD), both of whom soon arrived and took the girls to the hospital for us. The mother eventually arrived and said that they merely needed a bath!! There was not much concern on her part beyond that. Since the Lingap Center is not licensed to take babies, we contacted several agencies who could, but they would not accept responsibility for them since the girls were so malnourished. They did not want the medical expenses and probable burial costs since the likelihood of their survival was so low. The twins had no hope and no place to go. Eventually, both girls were hospitalized through the Lingap Center for approximately four months and we learned that they also had pneumonia, tuberculosis and both had a cleft palate (inside). Additionally, we found that they were not nine months old, rather they were19 months!! Their mother ultimately gave up her parental rights. In due time, the girls, Genalyn and Genelyn, recovered and were released to one of the Lingap Center social workers who took them in as foster children. 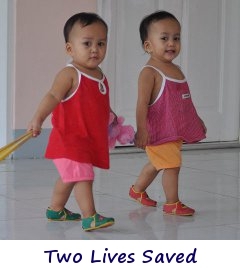 When they reach age 4, they will be admitted to the Lingap Center, where they will ultimately grow up. In the meantime, they frequently spend their days with their foster mother at the Center. Both girls are doing exceptionally well. Genelyn has fully recovered from her tuberculosis and has had her cleft palate surgically repaired. Genalyn is continuing to recover and will soon have her surgery. The Lingap wards (and staff) adore them and I am proud to say that they now have 120 doting parents! This is quite a contrast from the situation in January! I just thank God that we happened to visit that particular squatter area on that day and were able to rescue them. However, the miracle is that even though we may have been the instruments who found them, the people who actually saved their lives were you, our supporters. Without you, there would be no Lingap project nor would we have been able to have them hospitalized, or provide them with a home, an education or a future. Thank you for being there for Genalyn and Genelyn. They are alive today because of you. 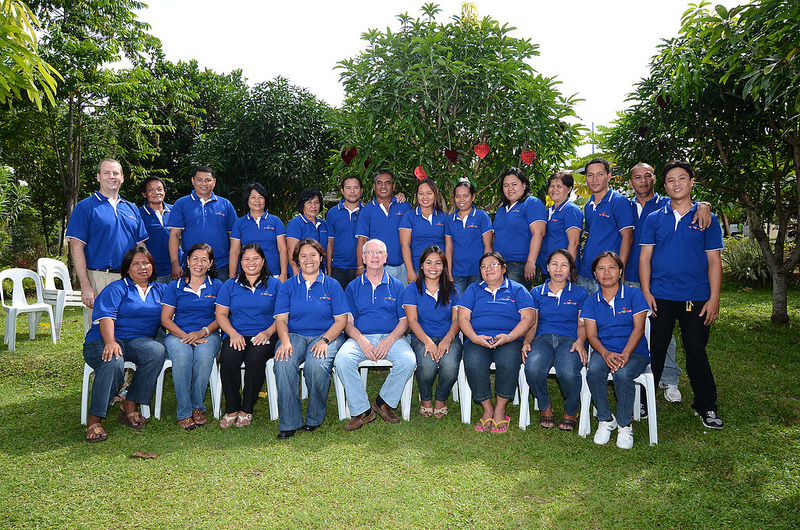 Not a day goes by that I don't thank God for the Lingap Center, the Center staff and all of you. Now, instead of facing a very young death under horrific circumstances, the girls have a chance for a tremendous future. They are on their way! It doesn't get any better than that. Perhaps we can't save them all, but we have certainly saved these two.